Krakow, Poland - England will attempt to reach the last four of a major tournament for the first time in 16 years on Sunday as they face Italy in a heavyweight Euro 2012 quarter-final collision. The burgeoning confidence within Roy Hodgson's youthful squad is tempered by the knowledge that England have rarely progressed beyond the last eight of major tournaments, with three quarter-final exits in the past 10 years alone. But after winning Group D ahead of highly-rated France and extending their unbeaten run to five games, England head into Sunday's test in Kiev with a mounting sense of belief that they can prolong their stay in the tournament. "If we can go about the job in the way we are doing at the moment we will make a game of it and who knows what will happen," Hodgson said. "It will be another even encounter, another game that will swing either way. The good thing is we are there, we are taking part and still in the competition and we want to be in the competition because we have really enjoyed it." A potential headache for Hodgson is that no fewer than five key players are walking a disciplinary tightrope heading into the match. Steven Gerrard, Ashley Cole, Ashley Young, James Milner and Alex Oxlade-Chamberlain are all just one booking away from missing a potential semi-final against either Germany or Greece. However, Hodgson will instruct the players in jeopardy to ignore the threat of suspension for fear it could inhibit their performance. Hodgson will harbour the biggest concerns over his captain Gerrard, the Liverpool star who has lit up England's performances so far with a series of inspirational displays from midfield. Gerrard has set up three of England's five goals at these championships while at the same time shielding his team's defence effectively with Scott Parker. Hodgson is expected to field the line-up which started in the 1-0 win over Ukraine on Tuesday, with the more defensively minded Milner holding his place on the right side of midfield ahead of Theo Walcott. Italy coach Cesare Prandelli meanwhile has been forced to reshuffle his defence following the injury to rugged centre-back Giorgio Chiellini, who is likely to be replaced by Leonardo Bonucci. Prandelli is wary of an England side which he believes have found the "right equilibrium" while maintaining the Azzurri have nothing to fear. "We all know the English character, they never hold anything back but they also have some good creative players," he said. In an ironic reversal of traditional stereotypes, Italy head into the game with plaudits for their attractive style ringing in their ears while England have been lauded for their defensive obduracy. Italy's veteran midfielder Daniele De Rossi believes England still bear the hallmark of former coach Fabio Capello while remaining under the influence of former Inter Milan manager Hodgson. "England are a very Italian team," De Rossi said. "You can see the signs, from Fabio Capello to now, with Hodgson. "One is Italian, one worked in Italian football. 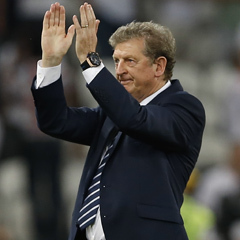 Hodgson was managing in Italy with Inter Milan, so his teams know how to play defensively and then attack. They will have very good players on the flanks but also be a really compact team. It won't be easy." The key battleground is expected to be midfield, where England are likely to require second striker Wayne Rooney to drop deep to prevent Parker and Gerrard from being outnumbered. "The particular challenge with Italy is in the midfield area where they have a lot of very gifted and experienced players, players who are technically good on the ball, and they're basically a central team," Hodgson said. "We're going to have to be careful we don't get outnumbered in that area and they don't play around us ... We have to be aware of that." "We're fully aware we're meeting a technical and experienced team, and a team that's been together for a while. But we'll prepare for the challenge they give us and we'll try and give them a few little headaches of our own."